The post K9 Salute Honors Canines Killed in the Line of Duty — and Gives Back by Melissa L. Kauffman appeared first on Dogster. Copying over entire articles infringes on copyright laws. You may not be aware of it, but all of these articles were assigned, contracted and paid for, so they aren’t considered public domain. However, we appreciate that you like the article and would love it if you continued sharing just the first paragraph of an article, then linking out to the rest of the piece on Dogster.com. 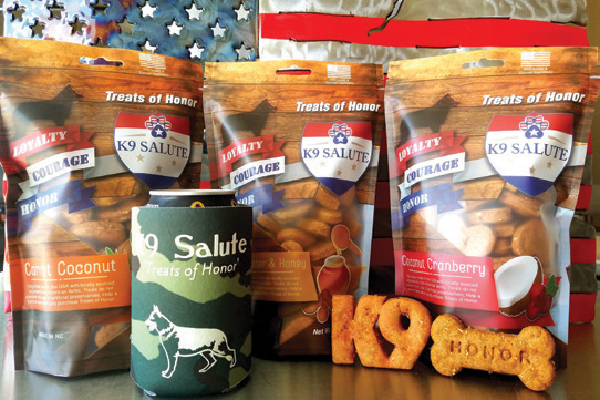 This company — K9 Salute — caught my eye because beyond making yummy treats for dogs, its goal is to honor those hero dogs who gave their lives in service, plus donate a portion of all sales to help veterans get service dogs and to help police K9s from all across the country get protective vests. On each treat bag, you’ll see a tribute to a dog killed in the line of duty. The dogs are from all different states. K9 Salute. Photography ©In Between the Blinks Photography. Jessica, a retired combat medic from the Washington Army National Guard, founded K9 Salute in 2016 after eight different K9 officers were killed in about a month. All the treats are created with ingredients sourced in the USA from local veteran-owned farms. And of course, Jessica’s Bullmastiff, Tilly, serves as VP of quality control. This small company — it’s just her right now, but she’ll be building a small team in early 2019 — has garnered a lot of attention, chosen by SCORE as a North Carolina 2018 American Small Business Champion in a contest sponsored by Sam’s Club and one of the 2018 winners of the Bob Evans Farms’ Heroes to CEOs contest. What’s Next for K9 Salute? “I want people to understand the important mission behind the company and not only feel confident about the products they feed to their dogs but also feel good that they’re a big part of helping protect K9s around the country,” Jessica says. “Over the next few years, I hope to have developed long-term relationships with farmers for sourcing ingredients to continue to offer innovative and new products for consumers and their dogs. The pet industry is very exciting right now and it’s hard to say exactly where K9 Salute will be in a few years, but it’s important to stay at the forefront of developing trends while staying true to the mission. One of my big goals is to be in a position where we can sponsor one K9 each month around the country to provide a protective vest and allow customers to be involved in the process by submitting K9s in their area that need help.” Follow K9 Salute at k9salute.com and @K9salute. Thumbnail: Photography ©In Between the Blinks Photography.